Get 2 Free KFC hot wings, Join the KFC Colonel’s Loyalty Club for free and start collecting chicken stamps towards free KFC food and drink. Get 2 Free KFC hot wings. Download the app and enter code G7AB55 at registration to get stuck into your first free side. Step 1: Register. 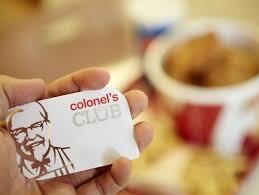 Download the Colonel’s Club app or pick up a card in one of KFC’s participating restaurants. Step 2: Collect. Just scan your phone or your card when you visit to start collecting Chicken Stamps. Step 3: Redeem. 3, 7 and 11 Chicken Stamps add up to free food and drink rewards!